The state recently authorized $1.5 million in funding toward the purchase of a hala forest in east Maui. The state releases $1.5 million to aid the "keystone species"
WAILUKU » With their splayed aerial roots rising from the ground, hala trees seem vulnerable, as if they could easily be knocked down by a large wave. But the hala has been in Hawaii longer than the Polynesians, according to scientists, and served for centuries as a foundation for Hawaiian culture. Under the Legacy Land Conservation Program, the state recently authorized the release of some $1.5 million to the nonprofit National Tropical Botanical Garden to preserve some 170 acres of land, including a hala forest in east Maui. The 170 acres are located on the Hana side of Pi'ilanihale Heiau in Kahanu Garden, a National Tropical Botanical Garden site. Charles "Chipper" Wichman Jr., the nonprofit group's director and chief executive officer, said the hala is the "keystone species" that preserves the native forest ecosystem along the coastline. The forest canopy of the hala, also known as pandanus, rises about 30 feet, protecting a number of native species including rare plants, ferns, insects, fungi and mosses. "These are organisms that have been here for millions of years and they deserve the opportunity to continue to exist," Wichman said. 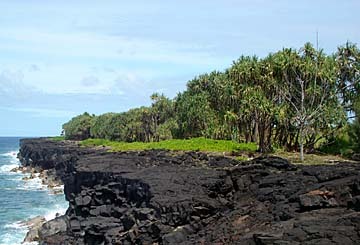 Wichman said the hala forest had stood side by side with the development of native Hawaiian culture for a thousand years before Western contact in the late 1700s. The Polynesians used the leaf of the hala to make baskets, mats, canoe sails and thatch roofs. Wichman said parts of the hala were also used for medicinal purposes, including a laxative concoction made, in part, from the male flowers and the juice from crushed hala roots. Wichman said his group wanted to purchase the land and preserve the native ecosystem, in light of nearby subdivision development. The nonprofit group also plans to increase its attempts to rid the area of invasive species, including the African tulip tree and inkberry shrub. While there are portions of the hala forest that are intact, the 170 acres will require restoration because of invasive species, said Kahanu Garden Director Kamaui Aiona. "It's going to take a lot of work," Aiona said. "It needs our help." Wichman said scientists had been debating for years whether the hala plant had come with voyaging Polynesians when they first settled in Hawaii centuries ago. He said Hurricane Iniki helped to settle the debate when it caused a boulder on Kauai to fall and crack and reveal its contents: a petrified hala tree. "The rock dated well over 1 million years," he said. "This is a totally unique fossil record."